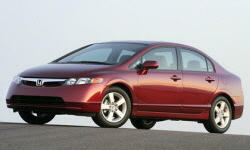 Honda Civic Warranty, Maintenance Cost Pros and Cons | Page 1 of 1 | Why Not This Car? Finally among the clear why-to-buys we have the aforementioned warranty. Hyundai's warranty runs 5/60 on nearly the entire car and 10/100 (for the first owner) on the powertrain. You'll enjoy the same warranty on a Kia Forte. But other competitors tend to have three-year basic warranties and five-year powertrain warranties. The Kia's feature-adjusted price advantage would be larger if we factored in its longer warranty: 5/60 "bumper-to-bumper" (with exclusions in the fine print--read it) vs. most others' 3/36 plus 10/100 (original owner only) on the powertrain vs. the others' 5/60. Goes about 6200-6500 miles between oil changes thanks to the Maintenance Minder feature, an improvement over the fixed 3000 mile oil change interval. Saves time, money and the environment if one doesn't have to change oil as often. Not adjusted for in this price analysis: Hyundai's famous warranty, 5/60 vs. the typical 3/36 "bumper-to-bumper" (with exclusions in the fine print) and 10/100 (original owner only) vs. others' 5/60 on the powertrain.